you in all aspects ! Shoot pictures or videos from any angle, three brushless motors are there to provide you superb flexibility. Use your gimbal in different operational modes for different requirements, switching between them is easy. The highly compatible hardware of Trio makes it suitable for wireless and sport mount. You may extend it via ¼” 20 threads which makes it perfect for self-shooting and higher-angle shooting. Trio senses the essential power requirements and hints on the same. All it calls for is to plug it in when asked for. Trio has got really powerful battery backup. Charge it and it can shoot for continuously 4 to 5 hours. Trio is now as flexible as never before! It knows how to hold your smartphone to keep those wobbly pictures away! This excellent gimbal has got a gyro, an accelerometer, a magnetic sensor and a 6-axis IMU (Inertial Measurement Unit) to avoid that shaky effect. You don’t need any tool to adjust it, it’s easy to go with Trio to make your memories truly stable! Trio has got three amazing modes of operation which add on to its functionality and make it a truly exquisite gadget for all. Whether you are a professional photographer or a gadget lover, you will definitely love Trio for its different modes- Full-Following Mode, Semi-Following Mode, and Lock Mode. Trio is the gadget I was waiting for! Loved it! Unique in style , friendly in use! Its amazing to use trio on the go! This 3 axis handheld gimbal stabilizer is a wonderful gadget that will astonish you in all areas as it has an amazing panning speed which no other gimbal provides. This amazing handheld gimbal stabilizer is rigged with a gyro, an accelerometer, a magnetic sensor and a 6-axis IMU (Inertial Measurement Unit) to shuffle off that unsteady effect in the pictures. You can totally forget about jitters and shakes as it has excellent flexibility. It knows how to keep those wobbly pictures away as it holds your smartphone perfectly. Your requirements will be in check as it can be operated in multiple operational modes. Compatibility is not an issue at all as it goes along pretty well with smartphones, iphone Gimbal , GoPro 3 axis handheld Gimbal stabilizer & Action cameras. Once charged you can totally forget to worry as it has a powerful battery with 4-5 hours of power backup. It can be used precisely as a handheld gimbal device or via remote as it has an unbelievable detachable design. Powerful CNC Machining is another powerful feature of this smartphone gimbal stabilizer as it has got a truly compatible hardware to mount the counterweights to the device as well as to connect it to some other devices. Its highly compatible hardware makes it absolutely suitable for wireless and sports mount. You may extend it via ¼” 20 threads which makes it perfect to extend for self-shooting and higher-angle shooting. 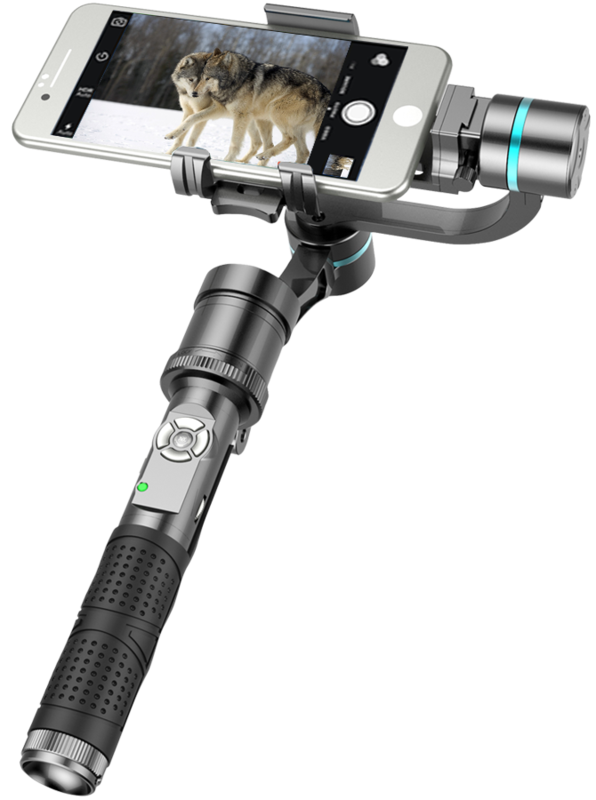 The Functionality of this smartphone gimbal stabilizer is awesome which makes it a truly exquisite gadget for all. Whether you are a professional photographer or a gadget lover, you will definitely love it. To sum up things, this 3 axis gimbal stabilizer is something that will make you totally stop worrying about jitters and shakes. This smartphone gimbal stabilizer keeps your needs in check owing to its multi-operability. It is your smartphone’s, GoPro’s best buddy as it goes along pretty well with them. It makes you totally worry free about the low battery, thanks to its 4-5 hours of power backup. Unbelievable detachable design of this handheld gimbal stabilizer enables you to use it precisely as a handheld gimbal device. A Truly compatible hardware of this smartphone gimbal stabilizer enables you to mount the counterweights to the device as well as to other devices too. Its Suitability for wireless and sports mount makes it a totally an exceptional device. You pour mindlessly. It tracks meticulously. That"s the real value of a device like Trio : It fits into your life. The data is presented beautifully.